Hat fits most women. Scarf measures 4 ½" x 50". RED HEART® "Super Saver®": Hat: 2 Ounces No. 318 Watercolor. Scarf: 2 ½ Ounces No. 316 Soft White CA and 3 ounces No. 318 Watercolor CB. Hat: Circular Knitting Needles: 5mm [US 8]-16"; Double Pointed Needles: 5mm [US 8]. 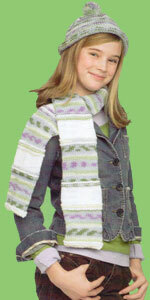 Scarf: Knitting Needles: 5mm [US 8]. GAUGE: 17 sts = 4"; 23 rows = 4" in St st. CHECK YOUR GAUGE. Use any size needles to obtain the gauge. With 16" circular needles, cast on 88 sts. K 1 row, then join, being careful not to twist sts, and continue to Knit every round until approximately 6 ½" from beg. Shape Crown (Note: Change to double pointed needles when necessary)-Rnd 1: [K5, K2tog] 12 times, K4 - 76 sts. Rnd 2 and every alt end: Knit. Rnd 3: [K4, K2tog] 12 times, K4 - 64 sts. Rnd 5: [K3, K2tog] 12 times, K4 - 52 sts. Rnd 7: [K2, K2tog] 13 times - 39 sts. Rnd 9: [K1, K2tog] 13 times - 26 sts. Rnd 11: [K2tog] 13 times - 13 sts. Rnd 13: [K2tog] 6 times, K1 - 7 sts. Cut yarn leaving 8" end. Weave end through remaining sts, draw up tightly, fasten securely. Optional: Make a 2" pom pon and fasten at top of hat. With CA, cast on 38 sts. K 4 rows. Note: Carry yarn not in use up the side edge on wrong side. * With CB, work 20 rows in St st, beg K row. With CA, K 2 rows. With CB, K 2 rows. With CA, work 10 rows St st.
Rep from * to * 5 times more, then rep from * to ** once. With CA, K 4 rows. Bind off. Sew up the back seam to form a tube. With the seam at the center of the flattened tube, sew the top edge together to close the tube; rep on bottom edge. ABBREVIATIONS: beg = beginning; CA, CB = Color A, Color B; K = knit; mm = millimeters; P = purl; rep = repeat; rnd = round; St st = Stockinette stitch (K on right side rows/rnds; P on wrong side rows. OR Knit every round. ); st(s) = stitch (es), tog = together; * at ** = repeat whatever follows the * or ** as indicated; [ ] = work directions in brackets the number of times specified.